Rawhide gifts and Gallery is well known for our Prairie Sunbonnets and our large selection of choices. Whether you are gardening, participating in SASS shoots or Western and or Civil War Re-enactments, we have 1850's bonnets geared for your occasion and style. Our bonnets have been used for women as cancer prevention after chemo, for children involved in living history school programs, and even used for weddings. 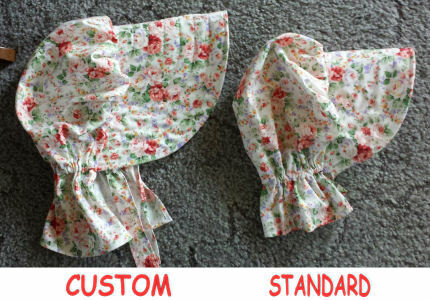 Our bonnets can be made to order for certain occasions or certain phycsical conditions. (we have custom made bonnets for cancer survivors, for hydrocephaly sufferes and more.) For groups, schools and churches, we do offer some discounts. Bootjacks are not relegated to western households or horse lovers alone. For anyone who wears boots, these are the perfect problem solver to toe-ing off your boots easily and conveniently. Because they are lightweight, yet sturdy, they can easily be fitted into your rodeo bag, or overnighter with no problem. For groups such as SASS shooters, 4-H, rodeos etc, we do offer discounts for quantities. For individuals, we have a personaliztion option as well. Best of all, you know you are buying an American Made product. Besides the selection of earring and necklace sets we carry, we are now also offering a way to create and design your own necklace! Want to mix parrot feather with perergine falcon? We can make that happen! If you are interested in some personalization for your bootjacks, custom bonnets for your specific needs, wholesale order inquires…just email us, call us or text us. Our customer service will be happy to help you design or craft a solution for your needs.